The developed profiles and baselines provide a detailed picture of today’s heating and cooling energy use in the industrial, residential and service sectors. They help to answer questions about how heating and cooling is used, as well as where it already is, and is not (yet) relevant, and where it will be relevant in the future, if there is no additional effort made to decarbonise the sector. inputs (e.g. electricity, natural gas, biomass, etc.) are used to supply the identified heating and cooling demands for each (sub-)sector. This consistent set of data provides a solid understanding of the status-quo of European heating and cooling. 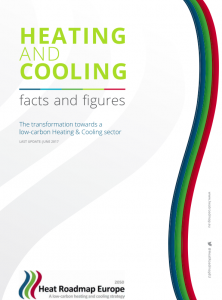 Published in June 2017, during the EU Sustainable Energy Week 2017, this brochure presents an overview of the profiles and gives a current state of the energy demand for heating and cooling in the EU in 2015. It opens the door to what needs to be done to complete the transformation towards a low-carbon heating and cooling sector. The full deliverables, with background data, assumptions and results, is available here. The following presentations show a summary of each country’s heating and cooling profiles; both from a general perspective and by sector. The 2015 heating and cooling profiles for all EU28 member states as spreadsheets available for download here. These Excel spreadsheets give you access to explore results not only for the 14 HRE4 countries, but also for the rest of the 28 EU member states.